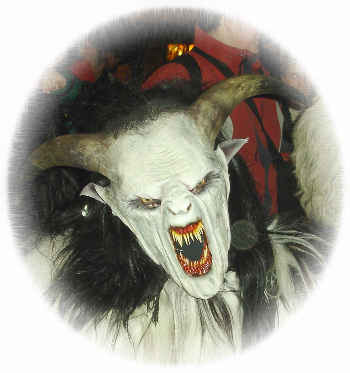 We walked off the main square to a side street and witnessed three Krampus coming towards us. One came up to a young woman only a few feet away from us, threw his arms around her, and as she struggled to escape, they both fell onto the ground, the Krampus on top of her. She pulled away, got to her feet, and escaped unharmed, but she had received the scare of her lifetime. With scenes of scaring like this all through the square for a couple of hours, the people of Salzburg could return home with their physical bodies secured from descent into the ground by their Ego bodies for another year. The compassion we felt for the frightened young woman no doubt helped our astral bodies to secure our etheric bodies. This book and the Krampuslaufen seemed to converge as if orchestrated in a movie to illustrate one of Steiner's themes in this book. I walked away with a new appreciation for the movies that people watch. Especially the ultra-scary horror movies which our teenagers seem so fond of. In America, we may lack a Krampuslaufen, but we have Halloween and Hollywood to provide us with ample doses of fear to secure our physical bodies and of compassion to secure our etheric bodies. [page xvi] As with all living things, expansion must be followed by concentration, openness of heart toward the outside must be supported by constant strengthening of the center of life. Anyone who skips over Introductions when reading a book must be urged to read any that are written by Chris Bamford. One might miss this insight into the three states of consciousness as they are described in the Mandukya Upanisad and embodied in the trinity of sounds in the one-syllable word, AUM. [page xviii] The three states of consciousness — waking, dreaming, and dreamless sleep — with which he [Steiner] begins, hark back to early theosophical teaching. No explicit reference, however, is made to it. Nor is any reference made to its origin in the Mandukya Upanisad, which describes the mystic syllable aum in terms of its three elements — a, u, and m — explicitly identified with the waking, dream, and dreamless states. What is the "mystery of death" that is in the subtitle? One can only unravel the mystery of a process by undergoing the mystery. Watch a child the first time he sees a roller coaster. He wants to experience it. Or as he encounters a maze or a puzzle. His attention is riveted on the mystery of new adventures until he has experienced it. Steiner directs our attention in these lectures to a salient fact about the Mystery of Golgotha(1), namely, that the gods being immortal had never undergone the human process of death before then and thus death had remained a mystery to them. Anyone who communicated directly with the spiritual world before the Mystery of Golgotha could unravel the mystery of birth, but could not unravel the mystery of death because death to the spiritual beings themselves remained a mystery. Steiner unravels the mystery of death for us in the course of these lectures, as we shall see later in this review. What is the nature of dreaming? The conclusions drawn from the sleep experiments of materialistic scientists will be of little help because the scientists presuppose there are no spiritual bodies such as the etheric, astral, and Ego ("I") bodies of the human being. As a result you can only expect them to produce descriptions of sensory data (e. g., REM or Rapid Eye Movement) they observed from a person's sleeping and to create abstract intellectual rationalizations about what the sensory data meant (e.g. that REM periods are periods of dreaming). It is true that if you awaken someone during REM periods, they will experience a dream, but exactly what happens during dreaming is left to the sleep scientist's imagination which is circumscribed by the sensory data observed. On the other hand, Steiner as a spiritual scientist gives us a clear image of how and when dreams occur and how the four bodies of the full human being are involved in dreaming and waking processes. [page 2, 3] What is actually going on when we dream as we are waking up? We know that as far as the soul-spiritual part of our being — we call it the astral body and the "I" — is concerned the time between falling asleep and reawakening is spent outside of our physical and etheric bodies. We are then in a world that we cannot perceive with our everyday consciousness, because the astral body and "I" have not yet developed the organs needed to perceive it. Nonetheless, time spent outside of the physical body during sleep is full of activity. Although we cannot perceive it, the life of the astral body and "I" is actually richer during sleep than it is by day, when we are awake. Everything that plays into our dreams — for example, in the form of mounting and discharging tension, fear, anger, rage, and so on, which can be clothed in a variety of images — is with us from the time we fall asleep to the time we wake up. In these out-of-body states, we inhabit a different world and participate in its action, just as we take part in events of the outer, physical world through our senses while we are awake. When we wake up, our soul-spiritual components, the astral body and the "I," reenter the physical body and immerse themselves in its organs. In this instant, we again become able to perceive the outer world of the kingdoms of nature — minerals, plants, animals, human physical bodies. We relate to this outer world through the physical body's soul-pervaded organs. But what happens if we immerse ourselves in the etheric body and remain at that level for a moment before taking hold of the physical body completely? When that happens, forces arising from the etheric body shape the images of a dream. These images take the form of reflections or recollections of our life. [page 6] There are also three such states in sleep, but we usually distinguish only two of them, light sleep (in which dreaming can occur) and dreamless sleep. The first can be compared to thinking in the waking state, the second to feeling. Very few people realize that there is also a third state of even deeper sleep. We remain unaware of the difference between the middle sleep (dreamless sleep) and deep sleep, which is comparable to willing in the waking state. Nonetheless, this third state exists. I am certain that some people notice the difference between these two levels of deep sleep, at least when they wake up. On some nights we experience only the two states of dreaming and dreamless sleep and we never enter the second level of deep sleep, which is clearly different from mere dreamless sleep. Some people , however, will sometimes notice that they feel totally renewed on awakening. This is an indication that they are emerging from an unusually deep sleep, from deeper levels of being. [page 7] In deeper, dreamless sleep, we are submerged in a realm that also exists all around us, but inside plants. In dreamless sleep we become like spirits that can creep inside plants. In the third stage of deepest sleep, however, we are completely submerged in the mineral kingdom. During this stage, mineral processes -- the alchemists of earlier times called them salt processes — are at their most intense in the human body, and we abandon the body not simply to plantlike level of existence but also to the mineral state. The third and deepest realm is that of karma, a realm in which if we were conscious we would experience our own karma, how our previous lives flow into our present one. But one must first develop an organ of perception in order to perceive one's karma. It is a spiritual organ that humans at the present time, for the most part, are not born with, but can develop on one's own. And it must be a spiritual organ of perception because the use of any physical organ of internal perception would be fatal to the user. [page 8] Developing physical organs of perception would kill us, because the human body cannot survive when the forces that produce sense organs are turned inward. If we could turn these forces inward, we would be able to view our own karma physical organs. In reality, we can do this only with spiritual organs, through Intuitive cognition. Where do the four bodies of the human being go during sleep? They go into the four elements as humans have known them for thousands of years: fire, air, water, and earth. We know earth as the ground under our feet, water as the comprising the rivers, oceans, and water vapor, air as filling the atmosphere surrounding us and filling our lungs every second, and fire or warmth as the life-sustaining rays of the Sun in its various forms. [page 11] Another phenomenon evident to spiritual perception is the following. If you observe a person falling asleep, the astral body remains in air-filled space when it moves out on the rhythms of the breath, but the "I" "disappears" into the warmth of the outer world. The soul lives in air and in the warmth ether during the time between falling asleep and waking up. Thus, the human constitution includes the physical human body, which actually belongs entirely to the Earth; the etheric body, which has a special connection to the Earth's watery or fluid element; the astral body, which belongs to the element of air; and the "I", which belongs to the element of warmth, or fire. When the cosmic Word moves into the human body, we can see it draw together the forces of air and warmth and combine them with the forces of water and earth. This whole interplay of forces is then developed by the internalized soul when the human being descends from the world of spirit and soul to begin an earthly existence. [page 11] Although these things are apparent only to inner vision, they exist nonetheless. It is difficult to express them in the words of any of our modern languages, which are totally adapted to materialism and a materialistic worldview. But attempts to express them are important and must become increasingly successful. What the science of initiation allows us to say about higher worlds can be clothed in words that anyone can understand — in straightforward thoughts that can make themselves at home in any human soul. While it is true that these things can be discovered only through supersensible research, understanding them does not require the ability to conduct such research oneself. We have a plant in our gardener which is purple, produces tiny blue flowers, and spreads very easily — it is called Wandering Jew. It never occurred to me that there could be an historical person called by that name. His name is Ahasuerus and he is a polar opposite of Christ. "At the same time that a god became mortal human (Christ), a mortal human (Ahasuerus) became an immortal god," destined to wander the Earth forever, and is called the "Wandering Jew". [page 15] He is the guardian of Judaism in the time after the Mystery of Golgotha. Initiates know that Ahasuerus walks the Earth to this day. Because he has become a god, we cannot see him in human form, of course. Nevertheless he continues to wander through earthly existence. . . .
As a spiritual being active in cosmic evolution, Ahasuerus attempts to prevent the normal next step for human beings, namely, the possibility of returning, through the Christ, to the spiritual world we left when we lost the faculty of atavistic clairvoyance. [page 28] It is undeniably true that the Christ has dwelled in us since the Mystery of Golgotha. When clairvoyant vision is directed inward, we can find the Christ within ourselves. When it is directed outwards, toward human life around us, Ahasuerus, the wandering Jew, appears to us. Everyone has heard of Out-of-Body-Experiences, but few have experienced them, it seems. Actually everyone has these OOBE's every night while they are asleep, but we will only become aware of them if we somehow achieve full consciousness while we are asleep. If we were to do so, we would also be able to view the entire evolution of our cosmos as Steiner portrays in his Outline of Occult Science. We would see our human evolution as it progressed with the evolution of our Sun, Moon, planets, and Earth. Normally we retrieve only glimpses we call dreams which happen as we re-enter our body from the stage of light sleep. We usually enter our etheric body slightly before entering our physical body, and during that brief transition time, images flow into us from the etheric body and form themselves into what we call dreams. To perceive the evolution of the cosmos we would have to become conscious during our periods of deepest sleep, something which is rare for humans today, but which Steiner was able to do naturally from birth. He explains how humans today can train themselves to achieve this in his book, Knowledge of Higher Worlds. [page 21] Normally, we bring something back into our waking life (through dreams) only from this lightest stage of sleep. But as I described earlier, the images in these dreams are in no way definitive, because the same dream can be veiled in very different images. Nonetheless, the lightest stage of sleep can produce dreams; that is, we can bring something back out of this state of consciousness, or we can at least sense that we experienced something while sleep. This is true of the lightest stage of sleep. In several other places Steiner talks against the use of yoga breathing exercises, hinting that it is ill-advised for modern usage. In the next passage he explains that the ancient Indians were different from us. They could perceive naturally the spiritual world, and only by holding of their breath could they begin to perceive the material world of sensory data which is our natural ability today. The natural world to us today was un-natural to them because to them perceiving the spiritual world was a natural ability along with their ability to see the spiritual and soul aspects of reality at the same time. For them to see only what we call the "natural world" required special yoga breathing exercises. Once again Steiner shows us how we can rightly understand the full human being only if we understand the evolution of humanity and consciousness over historical and near-historical times. [page 30] Instead of doing experiments in laboratories, the people of these ancient times experimented on themselves, so to speak, by regulating their breathing. After inhaling, for examples, they held their breath and attempted to experience what happened inside the body as a consequence of this change. The character of these exercises is preserved, although in weakened form, in yoga. We should not attempt to imitate such yogic breathing exercises today. At that time, however, people experienced them as a way of achieving insights on a higher level than their ordinary perceptions of nature, which included not only what we now see in the natural world, but also the spiritual and soul aspects of natural objects. When the people of ancient India deliberately altered their breathing, these spiritual and soul elements disappeared, and the natural world appeared to them as we see it today. [page 31] The "I am" experience, which we take for granted, was possible for the people of ancient India only when they made an inner effort to alter their breathing. The ancient Indians felt like babies whenever they said, "I am." They did not feel in the present moment as we do when we say "I am". By this act of transporting themselves back to earliest childhood, they could experience that their soul and "I am" flowed into them from the world of spirit and soul. In my essay, The Childhood of Humanity, I discuss the issues of how we grow through the state of consciousness held by these ancient peoples during our pre-five-year-old childhood, and how we promptly forget most of those early memories as a result of the development of our cognitive memory capability. By the time the Greeks came long in the Greco-Roman Epoch, humans had developed strong sense of self or "I am." Unfortunately that led them to see a dead world around them which consumed people in the course of a lifetime. They needed something to help them feel healthy again and they turned to tragedies for their healing. [page 34] In the early days of Greek culture, people experienced quite vividly that daily life made them ill and that they needed something to make them healthy again. that something was tragedy. People felt they were being consumed and making themselves sick, so they went to see tragedies performed in order to be healed, to become whole again. In Aeschylus' time, people still experienced the tragedian as a physician who made exhausted people well again. The feelings stirred up by the tragedies — fear, sympathy for the hero, and so on — worked like medicine. The spectators were filled with these feeling, which provoked a crisis in them, similar to the crisis in pneumonia, for example. Overcoming the crisis then led back to health. The people of ancient Greece approached the tragedies expecting to be healed, knowing that awareness of the "I" had driven the gods out of the world around them. In essence, Greek plays depicted the gods, the divine world, and the destiny that even the gods must suffer. In short, these plays presented the spiritual forces at work behind the "dead" world of nature. For the Greeks, therefore, art still involved healing. [page 60] In times long past the human being felt nature all around him (green), and that nature was everywhere filled with soul and spirit (red). In somewhat later times the human being still felt nature, but he also felt the possibility of perceiving his own 'I am' (yellow) in contrast to a nature that was now devoid of soul. But for this he needed the image of the god present in man, and in the god he sensed Dionysus shown to him in Greek drama. In still later times the human being again felt soulless nature (green) and in himself the 'I am' (yellow). But now the drama becomes fact. The Cross rises up on Golgotha. But, at the same moment, that which the human being had originally lost rises up within him and shines (red) out of his own inner being: Not I, but Christ in me. Few people consider today the ebb and flow of observing and activity. A lumberjack when chopping a tree typically inhales as he observes where his next stroke will fall and then on the exhale speeds his axe forward. This combination of inhale-observe followed by exhale-action can be found in all of our human activities, but is rarely noticed today. In his Lecture on Historical Changes in the Experience of Breathing (Ch. 4), Steiner explains how this evolved over historical times from the ancient Indian yogis until now. We know that we can feel a little intoxicated by the inrush of pure oxygen, and that CO2 (carbon dioxide), a dead air, replaces the oxygen when we exhale. Note how Steiner shows with these simple facts of life how wisdom and faith flowed together in the human beings of times preceding ours. [page 42] This awareness of breathing, however, was intimately related to everyday life. Consider this very simple example: Here is a piece of chalk. Today, as we look at a piece of chalk, we develop the intention to pick it up, and then we do so. That is not how it worked for the people of ancient times. They looked, inhaled the spiritual aspect of the chalk, then picked it up only as they exhaled. For them, inhalation was bound up with observation and exhalation with activity. This rhythmic interaction with the environment survived into later times but without the vital, perceptive consciousness of ancient times. For example, think back to how threshing was done by hand in the countryside not so very long ago: Look, strike with the flail; look, strike; look, strike. The rhythm of the activity corresponded to a specific breathing pattern. The name sophia was given to the process of observing and those ancient Greeks who loved the process of observing were given the title, philo-sophers. It might surprise some of you, especially the scientifically inclined, to find that those Greeks if exposed to modern science would feel like their brains were being stuck with tiny needles. It would not surprise my wife, Del, who often reacts to my spontaneous lectures on a scientific fact that way. [page 43] This mingling of ancient and modern modes of perception was especially characteristic of ancient Greek culture. The Greeks had no concept of science as we know it today. If they had been told about the type of science that is taught in modern universities, they would have felt as if their brains were being stuck full of tiny needles. It would have been incomprehensible to them that anyone could derive satisfaction from such a science. They would have experienced it as damaging to the brain, because they still attempted to perceive remnants of the comforting expansion of the intoxicating breath that streamed into them mingled with sense perception. The Greeks perceived activity in the head as I have just described it, and they called it sophia. Those with a special fondness for developing sophia in themselves called themselves philosophers. Originally, the word "philosophy" pointed to an inner experience. Our horribly pedantic "cramming" of philosophy as a way of learning about this body of knowledge was unknown to the Greeks. To them, the word "philosophy" expressed the inner experience of loving sophia. The cosmic spirit once entered us through our breathing, but this knowledge has been progressively deadened or as Steiner called it, "paralyzed" by our sense perception. (Page 43) This happened to the inhalation process, sophia, and to the exhalation process, pistis. Pistis or faith was felt as a strength inside the human body when we exhaled. [page 44, 45] When the Greeks were active, they felt spirit and soul moving out and away from them. As a result, whenever they did anything or worked on anything, they felt as if they were allowing spirit and soul to flow into what they were doing. They experienced it like this: "I take in spirit and soul, which intoxicate my head and unite with what I see and hear. When I am active, I breathe out, and this element of spirit and soul leaves me. It goes into my work, into whatever I am hammering or grasping. I release spirit and soul from myself and allow them to stream into whatever I am doing." This is how the early Greeks felt, but then the perception of exhalation as a sobering process faded until only a trace of it remained in Greek culture. In early Greek times, people still felt that their activity transmitted spirit to the things they handled. In the end, however, this perception of exhalation was paralyzed by internal bodily sensations, such as work-related strength, warmth, and exertion or fatigue, just as the flow of inhalation toward the head had been paralyzed. People no longer experienced exhalation as tiring. Instead, when they exhaled, they felt strength or energy pervading their bodies. This strength inside the human body was pistis, or faith, the feeling of divine strength that allowed one to work. Thus, wisdom and faith flowed together in the human being. Wisdom streamed toward the head, and faith lived in the entire body. Wisdom was the content, or ideas; faith was the power of this content. The two belonged together. That is why the only Gnostic work that has come down to us from antiquity is entitled Pistis Sophia. Sophia or wisdom is diluted inhalation; pistis or faith is condensed exhalation. Now we can begin to discern what has happened to the philosophy of the ancient Greeks as it turned into what we call modern science. Sophia became diluted and pistis was lost to our awareness. As a result, we exist in a time when science has become a mere phantom of abstract thoughts and mathematical concepts, i.e., the "ghost of wisdom." What we call "faith" today, on the other hand, has become divorced from the objectivized divine element in us. It has been so subjectivized that it "rises like smoke from the body." [page 45] In later times, wisdom continued to be diluted until it became science. Similarly, inner strength continued to condense until people felt only their bodies and lost the awareness of what faith, or pistis, actually is. Because they no longer sensed the connection between sophia and pistis, people began to separate understanding based on outer sense perceptions from subjective, internal belief. First there was sophia, then scientia, or ordinary science, a diluted form of sophia. We might also say that sophia was originally an actual spiritual being that humans experienced as inhabiting their heads. Today, only the ghost of this spiritual being remains, because science has become the ghost of wisdom. Actually, we should fill our souls with this statement as if with a meditation: Science is the ghost of wisdom. And, on the other hand, what we call "faith" today is not pistis, the inwardly experienced faith of antiquity. "Faith" has become a subjective element closely bound up with egoism. It is a condensation of the faith of ancient times. Before faith became condensed, human beings had an objective sense of the divine element in themselves. Today faith rises up only subjectively, so to speak, like smoke from the body. Just as science is the ghost of wisdom, so to speak, modern faith is a condensed, heavier version of the faith people once experienced. In another preemptive strike against those who would criticize his Spiritual Science without taking the trouble to understand it, Steiner criticizes those who are oblivious to the evolution of sophia and pistis, what we call today faith and wisdom. It is amazing to me that scientists who are otherwise wary of showing their ignorance in their own fields would do so blatantly in fields they know little about. [page 45] If we succeed in seeing the relationship between faith and wisdom, we will not make superficial judgments such as "Anthroposophy is a system of beliefs, not a science." People who say this do not know what they are talking about. They are unaware of the connection between faith and wisdom, ignorant of the historical fact that they were once experienced inwardly as one. In our circles, we must present history as it is presented nowhere else. Where else do we hear history talked about in this way? Where else do we hear what breathing once meant to human beings when it was a totally different experience from what it has become today? A formerly very real element of spirit and soul has become very abstract; conversely, the ensouled body has become robustly material. Steiner wished to immerse the entire Earth in the waters of his spiritual science and thereby baptize its humans as new Christians all. From an endnote for page 37, the editor writes, "One of Rudolf Steiner's chief themes is that human beings must cease to be 'cosmic hermits' and become 'cosmic citizens'." This can only happen if we humans raise ourselves during Earth evolution to becoming spiritual beings before the planet on which we live dissolves together with all left behind cosmic hermits upon it. This, rightly understood, is the true meaning of the Last Judgment. In Chapter 5 "The Human Being As Portrayed in Greek Art" we find Steiner sharing with us the insights about the salubrious effects of fear and compassion on the human being. First we must understand that when a human spirit is ready to incarnate into a body on Earth, it is near death in the spiritual world. It desperately needs the influx of energy it will receive upon Earth incarnation. If that were not so, as it was with the human we called Buddha, there would be no need for one to reincarnate. One would have “escaped the wheel of reincarnation” forever. When we reincarnate the forces of the Earth provides us with an etheric body, a body of formative forces, forces brought into us from entire cosmos. We are truly, newly born as “a child of the universe”! [page 51] The physical body is the result of earthly forces working for the human being, so to speak. In the time between death and rebirth, we have no physical body to deal with. In last week's lectures, I noted that when the human spirit and soul descend from supersensible realms into physical incarnation, they are near death (spiritually speaking), and must restore their inner forces by experiencing life in a physical body. But the body that unites with what is descending from the world of spirit and soul is born out of the forces of the Earth. Until shortly before achieving physical incarnation, the descending human being also has no etheric body, or body of formative forces. Like the physical body, the etheric body unites with the soul-spiritual members of the human constitution, but its relationship to the cosmos is different from that of the physical body. What happens as we fall asleep? Our physical body attempts to reunite with the Earth and our etheric body attempts to spread back out into the universe. How do we overcome these tendencies? [page 52] In the morning, when we wake up and rediscover our physical and etheric bodies, it is as if our physical bodies were saying to us: "All night long, the Earth tried to absorb me. The Earth wanted to turn me into dust. I remained a physical human body only because the forces of your 'I', and your astral body had held me together yesterday and on previous days, and these forces persisted through the night." Similarly, the etheric body says: "I kept my human form only because resembling you has become a habit. Actually, the forces of the cosmos wanted to throw me to the four winds during the night while you were sleeping and outside of me." Each time we wake up, we must make an effort — through the "I" — to take possession of the physical body again in the right way, because it actually attempts to escape from us during the time we spend asleep. With appropriate training, the "I" can learn to sense its own efforts to repossess the physical body each morning, and the astral body can sense how it has to reshape the etheric body in its own image, forcing it back into human form to counteract the nonhuman form it attempted to assume during the night. We might say that during sleep the physical body loses the inclination to be possessed by the "I" and the etheric body loses the inclination to assume human form and starts to disperse. As human beings in the modern materialistic age, we have little sense of the efforts of the physical and etheric bodies to escape. But in ancient times, people knew about this reality and some of the traditions that we follow yet today were originally designed to allow our "I" to stave off the physical body's attempts to return to Earth and allow our astral body a way to keep its grip on the etheric body to hold it from escaping into the cosmos. [page 53] In ancient times, people realized that in such a case, the physical body would not be able to disintegrate automatically. The physical body's tendency to disintegrate develops only through illness or old age or the like. If the astral body and the "I" were unexpectedly forced to leave a completely healthy human physical body and the body of formative forces within it, the physical body would retain its humanlike form, because the tendency to be possessed by the "I" and astral body would still be inherent in it. The human form of the physical body would persist, immobilized like a sculpted column. Because the separation was so sudden, the physical body would not be able to disintegrate, and the etheric body would not be able to lose its resemblance to the astral body. The Greeks knew that our etheric body tends to separate into four separate figures each night which had to be re-combined into one human form in the morning before rising. Amazingly, these four figures are the same symbols for the four Evangelists: Matthew (angel), Mark (lion), Luke (ox), and John(eagle)(2). Somehow the four Gospels they wrote have the nature of each of these four figures and by the reading of these Gospels allow each of us to pull our four natures into one whole human being. [page 55] If we could be fully conscious of the process of awaking each morning, we would experience anxiety about being able to reenter the physical body in the right way. We would be afraid of not being able to get back into the physical body properly. In ancient times, the Greeks were very familiar with this fear. They also knew that the etheric body tends to dissolve into four separate figures each night — one like an angel, one like a lion, one like an eagle, and one like an ox. Each morning, the astral body has to exert itself to synthesize these four parts of the etheric body into something truly human. The Greeks loved their life in the physical and etheric body. I have often quoted a saying that comes down to us from ancient Greece: "Better a beggar on Earth than a king in the realm of shades," that is, in the underworld. Because they loved physical existence, they longed to be able to take possession of their physical body and shape their etheric body more effectively. Greek tragedy developed as a result of this longing. Aristotle's definition of tragedy, though formulated at a much later time, still clearly indicates that the Greeks did not think of their tragedies in the way that we do. Your experiences may be different, but in my experience modern people think that dramas are created so that when we are finished dealing with everything the day brings, we can sit down for a few hours and watch a more or less exciting presentation of events that are not real but just dramatic images. And yet, do not the movies we watch each night, in the theater or at home on television, bring us various combinations of fear and compassion, which create in us passions similar to what the tragedies of Greece created in the population? Attending the yearly tragedies were a rite of Spring for the Greek people and every one was expected to be in attendance. This annual rite helped them to hold onto their physical and etheric bodies for another year. In every culture, yet today, one can find annual celebrations which arouse fear and compassion such as the Mardi Gras in New Orleans, Halloween all across the USA, and the Krampus Run in Salzburg. Add to these the many Hollywood movies made to frighten us all year long or the documentary movies of those who overcame great odds to succeed which arouse compassion in us. We do best when we recognize, like the early Greeks did, that all parts of our life contribute to maintaining the wholeness of our human existence. [page 55] To the early Greeks, all life was one, and all of their contributions were intended to be living parts of the wholeness of life. In their view, the purpose of tragedy was to help people take hold of their physical body and shape their etheric body properly. Tragedy evolved in a way that allowed the audience to feel fear and compassion. Experiencing fear gave them the strength to take hold of their physical body properly each morning, and feeling compassion made their astral body stronger and more able to shape their etheric body properly. Show us tragedies, said the Greeks, so we can take hold of our physical body and build up our etheric body suitably, so we can be human in the fullest sense of the word. The function of tragedy in Greek culture was to help people become as fully human as possible in earthly existence. How is any of this practical to us as human beings today? Do you know anyone who has been sick? If so, it would help you and them to know that pain means that their "I" and their astral body have lost their strong connection to the physical body and the etheric body. When one stubs one's toe, e. g., the pain indicates that the etheric body has temporarily left the hurt toe. The pain eases when the etheric body returns. The healing by laying on of hands can be understood in a new way when one sees that the healer has a strong etheric body which soothes the pain by entering slightly into the hurt place until one's own etheric body can return. The compassion shown by a mother who kisses a skint knee of her son helps the boy's astral body to grab hold of his etheric body and fill back in the place it had vacated, thus relieving the pain instantly in many cases. In Greek art we have two sculptures which represent the extremes to which humans can go: Niobe turns to stone and Laocoön struggles against death. We can only truly understand the meaning of these sculptures or even see them as two extremes if we understand the spiritual reality that underlies them. 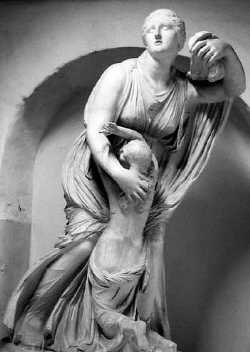 In the case of Niobe, she has torn her soul out of her body because of the loss of her children due to her own hubris, but the forces of the "I" and astral remain to hold together the form of her body which is thence turned into stone. With Laocoön, his physical and etheric bodies are being destroyed from without and he struggles to hold onto his "I" and astral body. One look at each sculpture speaks volumes as to the two extremes of human suffering. [page 58, Niobe] Through Anthroposophy, contributions to civilization that emerged from a feeling for the human being as a whole (such as Greek tragedy or a work of art such as the Niobe group) become increasingly transparent to us. We understand that Niobe's soul — that is, her "I" and astral body — is completely outside her body, in the sphere that is the source of her pain. Her soul has been torn out of her body by pain, but the body remains imbued with the forces of her "I" and astral body. Its form persists, held together by these forces, and Niobe is turned into a pillar of stone. 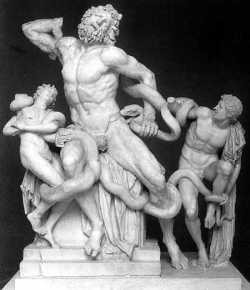 [page 59, Laocoön] We find this situation depicted in another Greek sculpture, the death struggle of Laocoön. We can understand this sculpture if we fill ourselves with the understanding that it depicts a situation that is the opposite of what happened to Niobe. The physical and etheric bodies are being destroyed from outside and are struggling with the "I" and astral body, which are being forced out. We can see this phenomenon in the very shape of Laocoön's mouth and face and the position of his arms and fingers. Everyone remembers the passage from Hamlet where he says in his famous soliloquy, "death, the undiscovered country from whose bourn, no traveler returns." Steiner points out the curious situation that Hamlet had just finished talking to someone who had returned from that "undiscovered country". [page 60] No doubt Faust would have felt very uncomfortable when Hamlet, who has just spoken to the ghost of old Hamlet himself, mentions the land from which no traveler returns! Hamlet's memory must have been exceedingly poor if he could not remember just having talked to his father, who had indeed returned from that unknown land. In some of my earlier Eastern studies, I had come across the idea that the word aum contained all the sounds of the universe in its one syllable. 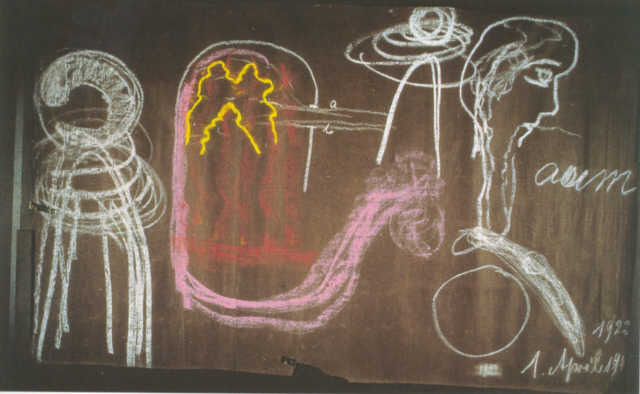 In this next passage Steiner begins by drawing on the blackboard and once more we are able to see the diagram he drew in full color. He explains how the word aum brings to life the cosmic mysteries within us. [page 64] Last week, I mentioned that when the original ancient Eastern yoga was in full flower, its devotees were able to attain higher knowledge by manipulating their breathing. They knew that the configuration of nerves inside the head reflected cosmic mysteries and that they could grasp these mysteries if they managed their breathing appropriately. (I am talking about the original yoga, not the decadent secondary developments we know as yoga today.) As the devotees of the original yoga inhaled, they sent their breath up inside the dome of the head, which is an image of the entire cosmos. They shaped this stream of air into a sound somewhere between a and o, or a and u. Like hands whose shape we adapt to the outer objects we touch, the sound a-u was adapted to touching and sensing cosmic mysteries. The resulting perception then became conscious as the air was allowed to flow out again in a mood of absolute devotion. What was accomplished by inhaling, by touching with air imprinted with the sound a-u, was then offered to the world in a mood of devotion, allowing exhaled air to flow out in the sound m. The breath, shaped inside the body into the sound aum, received cosmic mysteries as reflected or reproduced in the nerves inside the head. Cosmic mysteries were brought to life (or to consciousness) as the air was exhaled in the sound m. This was the basis of the original yoga training. A yoga student of ancient times experienced something like this: "The mysteries of the entire universe are in my head. I sense them when I inhale. When I inhale, I perceive cosmic mysteries. But I can hold on to them only as long as I maintain an attitude of absolute devotion to the cosmos. Otherwise, they remain in the unconscious." In other words, inhalation was shaped into the Cosmic Word, which weaves and surges as the force that creates the universe. When they grasped the Cosmic Word and then breathed out in absolute devotion to the cosmos, yoga students recognized inhalation as the revelation of the Cosmic Word and exhalation as its condensation and affirmation. Aum unites revelation and affirmation, bringing cosmic mysteries to life within the human being. During other studies I came across the phenomenon of blindsight as discovered by Lawrence Weisenkrantz and Nicholas Humphrey. In his book, Seeing Red, Humphrey describes how he developed a relationship with a blind monkey and over months of experiments came to understand that there was a form of sight possessed by the monkey which was totally unconscious. Later his predictions were confirmed when his mentor Weisenkrantz tested the hypothesis on blind human beings. In this amazing passage from a lecture given in 1922, we find Steiner predicting the existence of blindsight some forty-five years before these two scientists discovered it and gave it a name. [page 65] We cannot say that blind people are totally cut off from light. It works within them; they simply do not perceive it consciously. [page 74] People had to become outwardly familiar with death. If human beings had remained as unaware of death as they had been in ancient times, they would never have been able to develop their intellect, because intellect is possible only in a world ruled by death. Along came Ahriman who acted as an agent to the gods. Because he knows the wisdom of death, he can be thought of as the "Lord of the Intellect." Then along came the Christ who entered the human being named Jesus of Nazareth and died on the cross. This deed that Steiner calls the Mystery of Golgotha changed things for all of us so that we humans would not forever fall into the dead intellect and remained locked into Earth existence, but could continue our ascent back into the spiritual world. [page 75] Thus the gods were confronted with the dilemma of whether to relinquish the Earth to Ahriman in a certain respect. There was only one possible solution. The gods themselves had to become familiar with an element that was nonexistent in the divine worlds not controlled by Ahriman. Their representative, the Christ, had to experience death on Earth — death caused not by divine wisdom but by the human error that would gain ground on Earth under Ahriman's sole dominion. A god had to undergo death and overcome it. For the gods, therefore, the significance of the Mystery of Golgotha was that it enriched their wisdom with the knowledge of death. If no god ever experienced death, the Earth would have become completely intellectualized and incapable of evolving in ways determined beforehand by the gods. Christ, Steiner tells us, taught his disciples to "see death from the perspective of the divine world." We humans are also in need of learning to do this. From this perspective we can see Ahriman as a Sales Agent that a large corporation sent to a foreign country and who was headed towards taking over the entire country, so the corporation had to send a representative to fully experience the foreign country and make them aware that Ahriman was only an agent, not the corporation himself. [page 76] To understand the depth of this esoteric teaching, we must realize that the gods have defeated Ahriman by making his forces useful to the Earth and have blunted his power by learning about death through the being of the Christ. While it is true that the gods have included Ahriman in earthly evolution, they are simply using him and will not allow him to fully implement his rulership. [page 77] Without Ahriman, the gods would have been unable to bring intellectuality to humankind. And if they had not broken Ahriman's dominion through the Christ event, Ahriman would have made the entire Earth inwardly intellectual and outwardly material. We must see the Mystery of Golgotha as more than just an inner, mystical event. It is also an outer event, although not in the sense of superficial, materialistic historical research. The significance of this outer event is that the forces of Ahriman have been incorporated into earthly evolution but have also been overcome. A struggle between gods is played out in the Mystery of Golgotha. After the resurrection, the Christ imparted knowledge of this struggle to his initiated disciples through esoteric teachings. [page 78] He told them that events on Golgotha reflected super-earthly events and a relationship between Ahriman and the divine worlds responsible for the evolution of Saturn, Sun, and Moon and Earth as it was before the Mystery of Golgotha. He told them that the cross on Golgotha cannot be seen simply as a manifestation of earthly factors; in fact, it has significance for the entire cosmos. How might a disciple of Christ speak about his master's task? Steiner gives us some insight in this imagined conversation between two disciples. 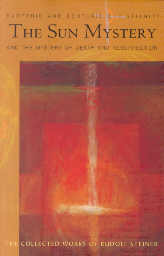 [page 78, 79] "The Christ, our teacher, came down to Earth from the spiritual worlds that people knew in ancient times. These people knew about the gods, but only the gods who could not tell them anything about death. If these gods were the only ones we ever knew, we would never have experienced the essence of death. The gods first had to send a being down to Earth so that they could learn about death through one of their own. Since his resurrection, the Christ seems to be teaching us about what the gods had to do to guide earthly evolution toward its appropriate conclusion. He is teaching us something that earlier human beings could not know. We are learning what the gods were doing behind the scenes in cosmic existence in order to further the Earth's evolution in the right way. For the benefit of humankind, they introduced Ahriman's forces into earthly evolution but prevented these forces from corrupting human beings." Steiner reveals to us how St. Paul understood the reality of Ahriman who introduced error into the world. In a curious irony, as it occurs to me, Abraham as the great progenitor of the Jews, had his hand stayed by an Angel when he raised it to sacrifice his son, Isaac, an innocent victim. And yet, generations later, Abraham's descendants would raise their hands to sacrifice an innocent victim upon the Cross, Christ Jesus. [page 80, 81] Of course, Saul was able to convince himself of this [that the most innocent of individuals was sacrificed on the cross] only by experiencing the reality of the Resurrection. Outside Damascus, Saul experienced the Christ himself and was convinced. But what did this experience mean to Saul? It meant that ancient wisdom no longer existed in its original form but had absorbed an Ahrimanic element. This is how Paul arrived at the insight that humankind's evolution had been appropriated by a foe who is the source of error on Earth. By introducing the intellect to human beings, this foe also introduces the possibility of error, and in the greatest manifestation of this error an innocent being was nailed to the cross. . . . The balancing of the divine and Ahrimanic worlds occurred behind the veil of sense perception but was played out in Christ Jesus' death on the cross. [page 96] Perhaps it will occur to some of you to wonder, what about those who cannot believe in the Christ? Let me conclude with a few reassuring words: The Christ died for all, including those who cannot yet unite with him. The Mystery of Golgotha is an objective, accomplished fact that is not affected by what people know or do not know about it. Nonetheless, knowing about it strengthens the inner forces of the human soul. We must apply all means available to us — our human cognition, feeling, and willing — to ensure that as the Earth's evolution continues, human beings will also know subjectively, through direct experience, of the Christ's presence within them. We mentioned earlier about how healing can be understand best if one grasps the spiritual realities underlying the processes of the human being in sickness and in health. To Steiner's view, our modern medicine is one of blind experimentation because of its lack of comprehension of the spiritual realities underlying the medical conditions of their patients. One need only listen to someone who spends a lot of time in a doctor's office to realize they often operate as pill-pushers doing experiments with human lives. Anthroposophy can influence practical activities such as medicine(3). [page 106] Medical knowledge of this sort can be cultivated by investigating how cosmos spirit influences human illness and health. I can say only a few words today about anthroposophical medical science as it already exists, but unless we move toward spiritual perception of the cosmos, all medicine, all psychology, and all therapy remain nothing more than the result of blind experimentation. We experience freedom as human beings only because we experience death. Without death we would have remained in thrall to the higher beings of the spiritual hierarchies, an angel of the tenth hierarchy as humans are sometimes called. But we are able to receive thoughts from the spiritual world, experiences which filled us before we incarnated upon Earth in this lifetime. Those thoughts are like soul corpses of our previous existence which we have received just as the Earth will one day receive this body we inhabit during this lifetime. [page 115] Whether through cremation or decomposition, the corpse returns to its native element, the Earth. After death, the body ceases to follow the laws that the human soul imposed on it, beginning at birth. Because it no longer incorporates any aspect of the human soul and spirit, it obeys the same natural laws that prevail among minerals. This is the physical fate of the human physical body after death. We must also acknowledge that a similar death occurs when the soul descends from existence in the world of spirit and soul to incarnate into a physical body at birth. This soul enters the physical human body in the same way that the physical human body enters the earthly element at death. As far as consciousness is concerned, our thoughts are the first thing we become aware of bringing with us from the spiritual world. The mental energy of thinking is the corpse of soul and spirit. Before our earthly existence began, our thinking led a life of its own in the world of soul and spirit, but only the corpse of this spiritual force is incorporated into our earthly existence. The physical body carries our thoughts, which are the soul corpse of our former existence, just as the Earth receives the corpse of the physical body after death. This is why modern perception is so unsatisfying. As long as we carry around this soul corpse, we grasp only the lifeless aspect of nature. It is an illusion to believe that we can discover anything other than lifeless nature through our modern experiments. Of course, we will encounter organized, living bodies as well as mere lifeless matter, but with the undeveloped thinking of personal consciousness, we will not be able to understand them. Even if we were able to create life in a laboratory, we would not understand it. As a soul corpse of its former self, our thinking is spiritually dead. It understands only dead things. We must accept this truth with open minds, because it is important to know that human beings absorbed this dead, abstract thinking only at a specific stage in evolution. Because abstract thinking has no inherent life and imposes no constraints on the inner human being, it allows us to become free. This is why human freedom developed only once we began to experience death. The Gospels as we know are only possible because of the direct knowledge, the gnosis, of early Christian times. This gnosis persisted with its ancient vitality far enough into the three centuries following the Mystery of Golgotha for the writers of the Gospels to interpret this great mystery properly. But for this gnosis, there would have been no Gospels today. If you have sought the mysterious Quelle or source of the Gospels, look no further. The source was not in a document, but in the ancient vitality or gnosis which was not a content in some document set, but rather a process, a living vitality of knowing in a set of individuals who lived in the centuries following the Mystery of Golgotha. Rightly understood, the Gospels are the Quelle, the primordial source of written documents of this ancient process of knowing! Look no further. [page 120] Behind our ordinary reading of Gospel contents rises an Intuitive vision, the actual source of the Gospels. Through Inspiration and Intuition, initiates develop an inner strength that leads not only to an awareness of life after death but also to objective Imaginations and truths about the outer world. Thus, initiates are not dependent on what the Gospels tell them. If the Gospels had not already been written, initiates could write them themselves. In fact, initiates take the correct view of the Gospel writers, realizing that enough of thinkings' ancient vitality persisted in the first three or four centuries A. D. to allow some individuals, even noninitiates, to behold the Mystery of Golgotha and interpret it correctly. If initiates of the early Christian era had not interpreted the Mystery of Golgotha through the gnosis of the time (which is similar but not identical to modern Anthroposophy), there would be no Gospels, because the Gospels were written out of the initiation science of old. "What does all this mean to us?" you may be thinking if you have read down this far. Does Steiner wish to kill religion and substitute some antiquated gnosis in its place? Only a shallow reading of Rudolf Steiner would allow one to reach such a conclusion. In this next passage he states clearly that his goal is to deepen religion, not deaden it, and he earnestly wishes to be a bearer of a love that will nurture the religious sense of all humanity. [page 124] The purpose of modern Anthroposophy is to encourage these realizations and to deepen, rather than deaden, our religious life by allowing us to break with old traditions consciously. Spiritual scientific knowledge of the Mystery of Golgotha allows us to transcend all the grave doubts we experience in modern religious life, which result primarily from our scientific education. Although exoteric science has made us free and achieved great outer triumphs, it has also instilled very understandable doubts in our hearts with regard to religious feeling and knowledge of our own supersensible nature. Anthroposophy, which works out of the spirit of science, has taken up the task of eliminating these doubts and implanting truly religious life in the human soul. Far from contributing to the death of religion, Anthroposophy will foster a revival of religious feeling and a new understanding of Christianity, which can be correctly understood and accepted only by turning to the Mystery of Golgotha. Because anthroposophically-derived spiritual knowledge will not only revive old religious feelings but also enkindle new ones, it is safe to say that Anthroposophy harbors no sectarian aspirations. This is as true of Anthroposophy as it is of any other science. Anthroposophy's purpose is not to found sects. Its intent is to serve preexisting religions and to revitalize Christianity in this sense. But Anthroposophy feels called upon to do more than simply preserve old religious feelings and allow traditional religious activity to continue. Its aim is to contribute not only to reviving but also to resurrecting the religious life that has suffered so severely under modern civilization. Anthroposophy hopes to be a messenger of love that will not only revitalize old religious feelings but also foster an esoteric resurrection of humanity's inner religious sense. If you change with the times during your life, liking a food you never liked before, a type of music you didn't like before, writers you never liked before, is it your fault you never liked them before or was it simply your destiny? Engineers walk into a building and find faults with it immediately — they are trained to do that kind of analytic thinking about their environment -- they get paid for thinking that way. It is their destiny as an engineer to think that way. It is not a fault. Steiner recognizes this and wants us to know that any scientific-minded aspects of his spiritual science is not to deemed a fault but rather its destiny. [page 139] Scientists compare ideas introduced by Anthroposophy to the rigorous science they are accustomed to. No wonder we need to give serious thought to how we relate to science! No wonder quite a few scientifically trained friends of Anthroposophy see it as their particular task to demonstrate that Anthroposophy can indeed be presented for all the world to see on scientifically justifiable grounds in any area of knowledge. This is what the reality of our situation demands. When you hear scientific overtones today in contents that we formerly communicated in quite different terms, this is not the fault of the anthroposophical movement, it is its destiny. This is what the world demands. We have had to present Anthroposophy to the broader public, and we have been able to do so only by entering into discussion with leading personalities. For us, however, the point is not to make Anthroposophy more closely resemble science. The point is to imbue science with Anthroposophy. What is evil? Steiner tells us evil is a good out of its time. It is good for us to have an intellect, but not to exclusion of our spirituality. Unless all humans recognize this, they stand on the verge of a great tragedy. What makes it difficult to recognize is that materialistic science is forever plumping its great achievements and progress for humanity while blithely ignoring the materialistic sinkhole which such progress is placing in the middle of the road of spiritual progress. It is a sinkhole into which the bus of progress upon which we are all passengers will have to negotiate some day and unless the bus driver is Christ instead of Ahriman we will all perish down that sinkhole. [page 141] This new accessibility of the spiritual world means that humankind now faces an important decision that cuts to the heart of every individual. For centuries, human beings have been developing their intellect, which has gradually led us away from spirituality. Although intellect is spirit — in fact, the very purest spirit — it no longer has a spiritual content. Instead, it has chosen the world of outer nature as its contents. In other words, the intellect is spirit but fills itself with something that cannot manifest as spirit. This is the great modern tragedy of the cosmos: In moments of introspection, we human beings must acknowledge that although intellectual activity is spiritual activity, our intellect is powerless to receive spirit directly. Instead, we fill our spirit with natural, material existence. This state of affairs is fragmenting modern human souls and turning them into a wasteland. Although we may not want to admit it, the spiritual regions of the human soul are becoming fragmented and desolate. This is the fundamental evil and the underlying tragedy of our time. Footnote 1. "The Mystery of Golgotha" is Rudolf Steiner's phrase for the salient events in the life of Christ Jesus during which he dies on the Cross and is resurrected. Footnote 2. Click on each of the symbols to see a stained glass window portraying the Evangelist with his symbol. The window appears at the top of a review of a Steiner lecture series on the Evangelist. Footnote 3. See my review of this book Steiner co-authored with Dr. Ita Wegner called Extending Practical Medicine.